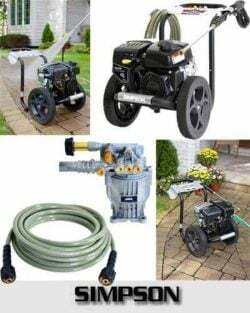 Are you worried about your heavy duty cleaning and want a really powerful pressure washer? Than, here is your solution! SIMPSON Cleaning MS60763S 3000 PSI 2.4 GPM Gas Pressure Washer is using a 196cc engine that offers you a great power 3000 PSI water pressure for your heavy duty cleaning. The Company has designed the pressure washer for using residential purpose and has a power almost equal to a commercial pressure washer. The compact steel frame design ensures the durability and the Axial Cam pump serves water flow of 2.4 gallons per minute. The machine gives you mobility with its 12-inch never-flat tires and there is on-board storage for its components. The machine provides a pro-style spray wand with 5 quick connect nozzle tips for your different uses. Combining the features and the facilities the device offers you a standard price so that you don’t have to think much about your budget. SIMPSON Cleaning MS60763S 3000 PSI 2.4 GPM Gas Pressure Washer has a 196cc KOHLER RH265 engine that is perfect for residential cleaning projects. The OEM technologies Axial Cam Pump is maintenance-free so it saves your valuable time. The engine delivers 3000 PSI water pressure and the pump provides water 2.4 gallons per minute. The manufacturer used welded steel to make the frame which is pretty strong than the regular plastic frames. The device has a pro-style spray wand that has safety lock system for preventing any sort of accident. With the spray wand, you can easily connect the 5 different quick connect nozzle tips which are 0-degree pencil point, 15-degree, 25-degree, 40-degree and a soap applicator nozzle. It has a nice on-board storage for keeping the spray wand, hose, and nozzles. There is a 25 foot MorFlex high-pressure hose equipped with M22 connectors. The material of the hose resists kink and abrasion. The device provides you a down-stream detergent injection system so that you can get a shiny clean. It has two 12 inch never-flat tires for your convenient movement and the compact design makes it easy to store in your garage. The weight of the product is about 63 pounds and the dimension is 23 x 18 x 33 inches. The light weight of the device makes it easy to carry it wherever you wand. You will get different limited warranties for an engine, pump, and other accessories starting from one year to two years. Immense Power: You will not feel less the power you are going to get out of the device. 3000 PSI water pressure comes under the commercial pressure washer. So you can easily wash away all the tough dirt from any surface and give it a shiny look. 2.4 GPM water flow is also compatible with the water pressure for an efficient cleaning. Different Nozzles: SIMPSON Cleaning MS60763S 3000 PSI 2.4 GPM Gas Pressure Washer you five different nozzle tips. 0-degree is the pencil point water flow that reaches to the corners easily; 15, 25 and 40-degree nozzles provide different wide water flow; the soap applicator nozzle delivers the water mixed with detergent to apply on the surface. These different nozzle tips will fulfill all your requirements. Durability: The machine is a long lasting device that allows you to clean for many years. They made the frame with strong steel, the Axial Cam Pump is maintenance-free, the engine is also long lasting one. The 25-foot high-pressure hose resists kink and abrasion. So you invest for one time and take the benefits for years. Warranty: You will get a limited warranty of 2 years for the engine, 1 year for frame and pump components and 90 days for spray accessory items. The warranties will nicely protect your investment. Now you can stay relaxed and contact the Company for any kind of manufacturing defect. There is a complaint that defective components come with the shipment. If anything like this happens you can easily inform the Company and they will change your defective components. In order to save money if you buy this product and use for the commercial purpose than it will be a wrong idea as this device serves 3000 PSI water pressure, not more. When you decide to buy a product you should decide that the product meets all your requirements. 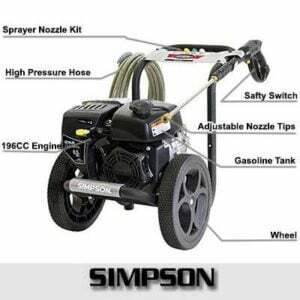 For residential use SIMPSON Cleaning MS60763S 3000 PSI 2.4 GPM Gas Pressure Washer is one of the best gas powered pressure washers available in the market. Think about the water pressure, durability, different uses then you will feel that this is the machine you wanted. Simpson is a leading brand in the market that develops pressure washers for many years and earned the users’ faith. You must know that gas pressure washers are a little more expensive when you compare them to the electric pressure washers. Considering the features and the facilities you will get the price of this device is not much, on top of that the warranty will secure your investment. Click to Check Latest Price & Buy on Amazon with Shippment, Now! I purchased one yesterday from Tractor supply in Sebring Florida yesterday for $289.00 It is just as you say, setup is a snap, just add included motor oil and gas hook up hoses set choke turn on gas and switch, pull starter rope squeeze handle on sprayer to bleed off air in the pump and go to work. Nice large fuel tank. Pressure is adequate for my needs. I like it. Thanks, William. We are glad that you got adequate information from here and you liked it.